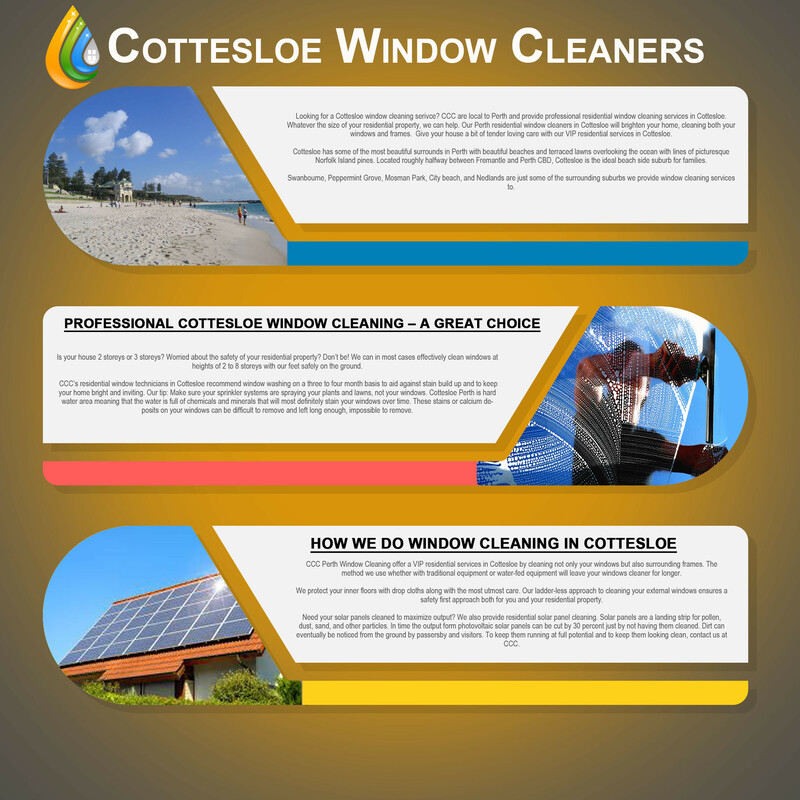 Looking for a Cottesloe window cleaning service? CCC are local to Perth and provide professional residential window cleaning services in Cottesloe. Whatever the size of your residential property, we can help. Our Perth residential window cleaners in Cottesloe will brighten your home, cleaning both your windows and frames. Give your house a bit of tender loving care with our VIP residential services in Cottesloe. Cottesloe has some of the most beautiful surrounds in Perth with beautiful beaches and terraced lawns overlooking the ocean with lines of picturesque Norfolk Island pines. 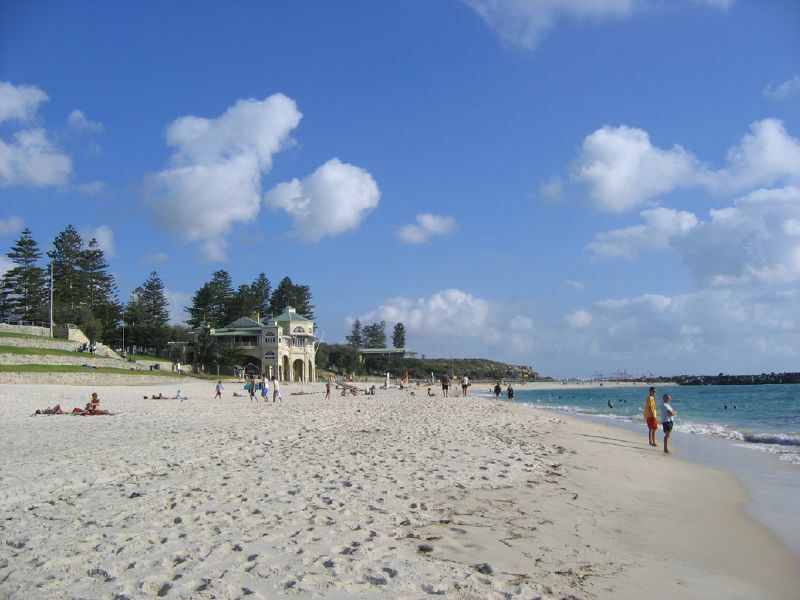 Located roughly halfway between Fremantle and Perth CBD, Cottesloe is the ideal beach side suburb for families. Swanbourne, Peppermint Grove, Mosman Park, City beach, and Nedlands are just some of the surrounding suburbs we provide window cleaning services to. Is your house 2 storeys or 3 storeys? Worried about the safety of your residential property? Don’t be! We can in most cases effectively clean windows at heights of 2 to 8 storeys with our feet safely on the ground. CCC’s residential window technicians in Cottesloe recommend window washing on a three to four month basis to aid against stain build up and to keep your home bright and inviting. Our tip: Make sure your sprinkler systems are spraying your plants and lawns, not your windows. Cottesloe Perth is hard water area meaning that the water is full of chemicals and minerals that will most definitely stain your windows over time. These stains or calcium deposits on your windows can be difficult to remove and left long enough, impossible to remove. CCC Perth Window Cleaning offer a VIP residential services in Cottesloe by cleaning not only your windows but also surrounding frames. The method we use whether with traditional equipment or water-fed equipment will leave your windows cleaner for longer. We protect your inner floors with drop cloths along with the most utmost care. Our ladder-less approach to cleaning your external windows ensures a safety first approach both for you and your residential property. Need your solar panels cleaned to maximize output? We also provide residential solar panel cleaning. Solar panels are a landing strip for pollen, dust, sand, and other particles. In time the output form photovoltaic solar panels can be cut by 30 percent just by not having them cleaned. Dirt can eventually be noticed from the ground by passersby and visitors. To keep them running at full potential and to keep them looking clean, contact us at CCC. Looking for Cottesloe Window Cleaners You Can Trust?